As we all agreed before napkins are the finishing touch to any formal table setting and especially for a wedding reception. 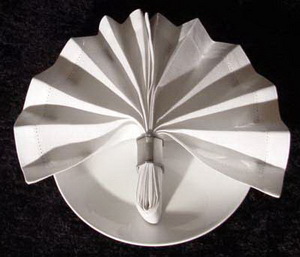 A fancy folded napkin will be the first table item your guests will notice when they sit down. Folding wedding napkins in a variety of shapes and designs is so easy that there is no reason why they cannot look beautiful. 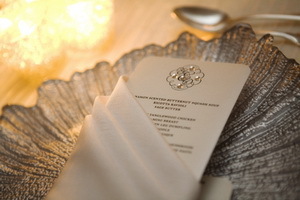 All that is needed is your wish to have custom and fancy napkins at your wedding. When talking about folded wedding napkins, there are so many designs that we can create that it is very difficult to settle just for one. From birds to flowers, plants, hats and more, whatever your wedding theme is, there are custom wedding napkin designs to complement it perfectly. One simple way to fold your wedding napkins is by adding a napkin ring. There are many types and styles of fancy napkin rings available but what you need to think about when choosing your napkin ring is if it compliments your wedding theme and tone or your wedding decorations. For a traditional wedding you should consider a classy silver napkin ring, but if you are having a modern special wedding you should consider opting for fancy crystal diamond napkin rings or even some colorful napkin rings. By choosing the right style and color of your napkin ring not only that you have custom folded napkins for your wedding but you make sure that your napkins are fancy, elegant and stylish. 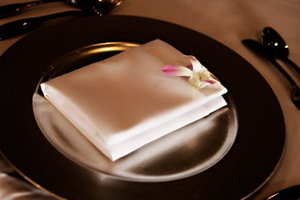 This style of folding your wedding napkins is also useful and will arouse the curiosity of your wedding reception guest. If you choose to put your wedding menu in your envelope folded napkin you will make sure that your guest will have something to talk about as soon as they sit at the tables. This fancy style of custom wedding napkins is perfect as ice-breaker if you have guests that don’t know each other. Just remember that to make sure that it works, your menus should be square or rectangle and their size should match the size of the folded napkins. The simple flat and folded napkin style is the simplest way to custom your napkin yet it looks very effective, even elegant. First, ensure your napkins are pressed and folded twice, then fold the napkin in half and place it on the centre of your charger plate or place setting or to the left underneath your cutlery. If you choose this style for your folded napkins, you should consider colorful napkins instead of classic white, just to add the sparkle you need. We can all agree that when we think about ribbons, the word “elegant” comes in mind. The choice of color, fabric and design is endless when talking about ribbons. 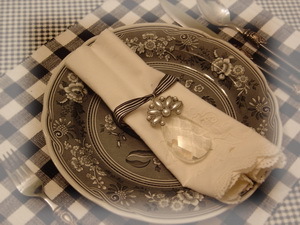 It is very simple to customize your wedding napkins by adding a fancy ribbon. For example: for a voluptuous bow you can use wired satin ribbon, for a simple knot you can use organza or satin ribbon, if you like sparkles and glamour you can choose to attach a diamante to the already fancy napkin ribbon. If you want to go even further, you can customize your napkins by adding your names and your wedding date on the ribbon.